I was looking for something to do with my big green bell peppers, other than making pepper steak beef, and my boyfriend suggested we make stuffed peppers. Neither of us had ever eaten or made it before, but it sounded pretty neat, so that was our project for the day! I found many different variations of the stuffed pepper online, and settled on a classic American stuffed pepper recipe that popped up at the top of my Google search :) I like the idea that stuffed peppers is a little bit like an everything but the kitchen sink dish… based on the various recipes I saw, you can pretty much put whatever you want in the pepper and it will still taste great, so I didn't have to worry about not having certain ingredients. 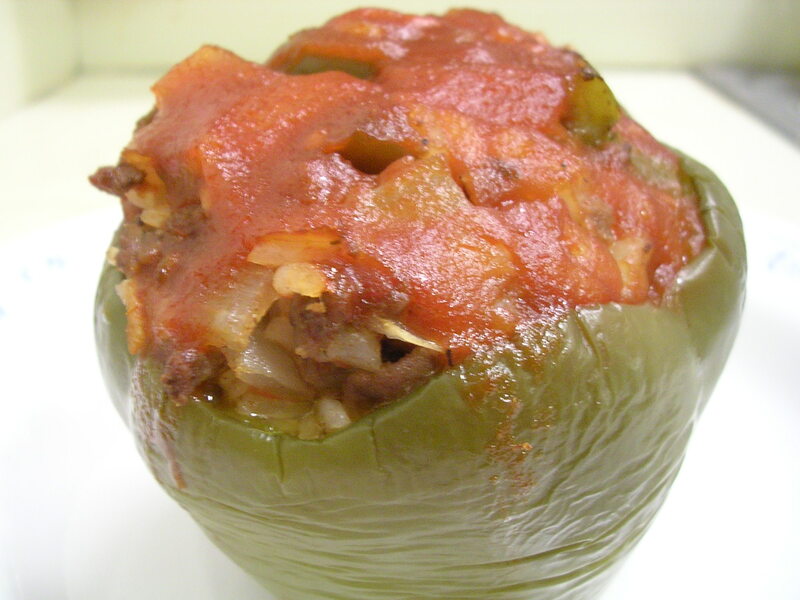 I particularly liked this recipe because it has a delicious ketchup-based topping that adds a lot of flavor to the peppers, just like the sauce that tops a good diner meatloaf. And as innocent as a stuffed bell pepper might seem sitting on your dinner plate, I guarantee it makes for a pretty hearty dinner. Pair it with a simple side and you're good to go! 1. Bring a pot of water to boil over high heat, adding 1/2 tbsp of salt to it. (If you're going to cook your rice fresh, then do it now so it'll be ready to go when you need it.) Wash the peppers and cut off the tops about 1/2 inch from the stem, so that you can reach into the pepper and pull out the seeds and spines. I diced up the pepper tops minus the stem, and added it to the filling for the peppers so that it wouldn't go to waste. 2. Place the peppers in the pot to boil, filling the insides with water to prevent them from floating. Boil for about 3 minutes, until slightly softened. Drain and set aside to cool. 3. Preheat oven to 350 degrees F. In a skillet, heat 2 tbsp of olive oil over medium heat. Add in chopped onions, pepper tops, and garlic, stirring often for about 3 minutes. Add the ground beef and cook an additional 3 minutes until the meat is just browned and the vegetables are soft and translucent. Season generously with salt and pepper (I used about 1/2 tbsp of salt and pepper combined) and mix well. Stir in cooked rice. 4. Drizzle 1 tbsp of olive oil to coat the insides of the peppers. Place them in a baking dish and keep them upright using a ring of scrunched up foil around the base if necessary. Fill each pepper with beef and rice mixture. 5. Combine the ingredients for the topping (ketchup, water, Worcestershire, and Sriracha sauce) and stir until blended. 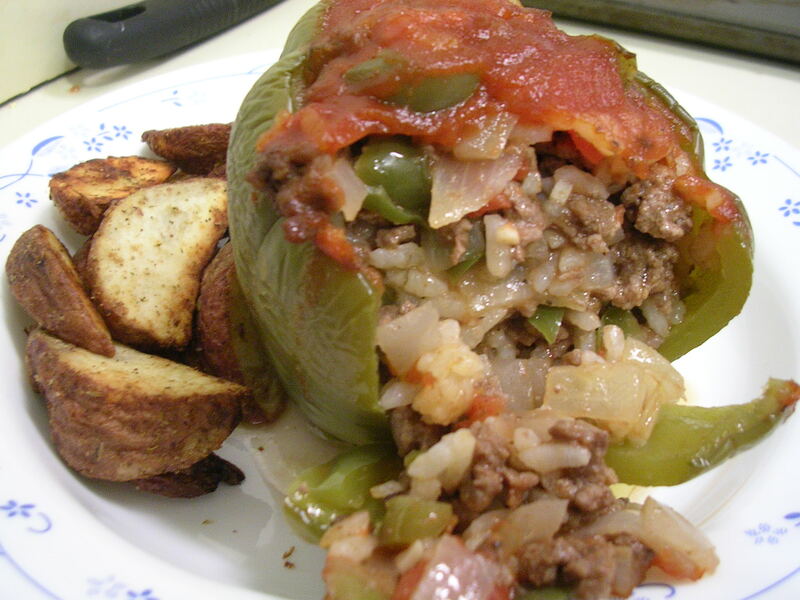 Spoon generously over the tops of the stuffed peppers – it should be somewhat runny but will mostly stay on top of the stuffing. Try to keep it from spilling off the peppers, since it can't be rescued from the bottom of the baking dish later. 6. Finally, pour 1/4 cup of water into the baking dish to keep the bottoms of the peppers from drying out during the baking. Bake for 30-40 minutes. Remove peppers, allow to cool for 5 minutes, and then serve. Enjoy! This entry was posted on Monday, February 18th, 2008 at 3:25 am	and posted in American, cooking, recipes, Uncategorized. You can follow any responses to this entry through the RSS 2.0 feed.